We know you have questions about this unique apparel. We have compiled a list of commonly asked questions to help you better understand the nature of Flame Resistant fabrics. HOW WILL FR CLOTHING HELP THE WEARER? Do we really need Flame Resistant clothing (we haven't had an accident in 20 years)? Flame resistant (FR) clothing saves lives because it significantly reduces burn injury, gives the wearer escape time, and increases chances of survival. Providing FR clothing demonstrates management's commitment to safety and employee well-being. It can improve morale as well as increase safety. What do all these standards and test methods mean? Performance standards and test methods allow users to objectively evaluate materials, and define minimum performance criteria for fabrics or garments. Using FR products that meet performance standard requirements helps ensure your people are wearing acceptable FR garments. What happens if a company does not comply with the laws? 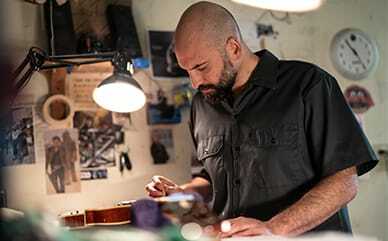 The Occupational Safety and Health Administration (OSHA) can cite employers for not providing appropriate protective equipment, including FR clothing. Not complying with the laws can leave your company open to OSHA fines and possible litigation from other sources. Isn't 100% cotton good enough? Garments made from 100% cotton are flammable. Cotton burns just as readily as nylon and polyester fibers, and sometimes spreads flames more quickly. 100% cotton is acceptable for use in some electric utility applications when exposure is not sufficient to ignite the cotton, but it should not be used in situations that require FR clothing. Isn't FR clothing too expensive? FR clothing is higher priced than standard work clothing, but it has significantly longer wear life, decreasing replacement costs over time. In addition, the cost of one serious burn injury can often pay for an entire FR clothing program..
Who's supposed to pay for FR clothing? FR clothing regulations and standards don't dictate who should pay for clothing programs. In most instances, the employer pays for some or all of the FR clothing program. It's easier for employers to mandate the use of FR clothing if they are providing it to employees. Some companies use payroll deduction systems to have employees contribute to the cost. Will the union like it? Often, unions consider FR clothing to be an added benefit because it protects members from workplace hazards. When people understand the purpose of FR clothing and are included in the decision-making process, most unions support providing FR clothing to their members. Which employees should wear FR clothing? It is the responsibility of employers to determine which employees are required to wear protective equipment or FR clothing. In some industries such as electric utilities, the hazard can be calculated. In others, the hazard must be assessed. Some companies have "inside the gate" FR clothing policies, where anyone on the premises is required to wear FR clothing. Other companies provide FR clothing to certain employees or for use when performing specific tasks. What about contractors and short-term employees? OSHA has issued citations and fines to companies for not requiring contractors to follow the same safety rules and use the same safety equipment as full-time employees, including FR clothing. Companies can require contractors provide its employees with FR clothing (the cost of which may be negotiated in the contract). Host companies can refuse to allow contractors to enter the site and perform work without the appropriate FR clothing. What type of FR fabric is best? Many FR fabrics are available on the market today that provide good FR protection in a number of environments. All FR products have a balance of properties, including protection, cost, comfort, appearance, color selection and wear life. Each company should select the product that best meets its overall needs, assuming that the product provides the required FR protection. What fabric do you recommend? Each FR fabric has a balance of properties that should be considered when selecting FR clothing. Each FR fabric has a balance of properties that need to be considered when selecting FR clothing. The selection of an FR fabric is an individual choice, and must be made by the end-use company. All products offer good protection in a number of applications. FR experts can educate purchasers on the relative merits of each product. However, it is up to the end user to make the final choice. Does the FR performance wear out? For some products, the FR performance is inherent in the chemical composition of the fiber, and therefore the FR performance cannot be removed. For other products, the flame-retardant treatment is guaranteed for the life of the garment, provided that proper laundering procedures are followed. How do you know the FR protection is still there? Unfortunately, there is no way of testing the FR performance of a garment in the field without destroying the garment in the process. Further, test results from one garment are not necessarily indicative of the performance of other garments in the program. Therefore, we recommend only using FR products for which the manufacturer guarantees the protection lasts for the life of the garment. FR clothing is a safety item for personnel working in environments with a hazard of clothing igniting. There are many climates where long pants and long sleeve shirts are hot, no matter what the fabric is made of. A variety of FR fabrics are available today, some of which are perceived as being more comfortable than others. FR clothing does not necessarily need to be more uncomfortable than standard clothing. How should FR garments fit? The looser fitting the FR garments, the more thermal protection the clothing system will provide. Air is a very effective insulator; therefore, maintaining an air gap between the clothing and skin will improve thermal protection. However, a loose fit must be balanced against the hazard of clothing being caught in moving equipment. Most FR products will shrink either the same or less than standard work clothing, and should be sized accordingly. What should be worn underneath FR clothing? FR garments should be worn over non-melting fabrics or other FR materials. For example, one recommended combination is wearing an FR coverall over a 100% cotton tee shirt and underwear. Layering garments in this manner dramatically increases the thermal protection of the clothing system by adding "air gaps" that provide excellent thermal insulation. What about wearing jackets over FR clothing? The outermost layer of clothing should be flame resistant. Wearing flammable garments (such as nylon parkas) over FR clothing will compromise the protection of the FR clothing system. Even though the FR garment will not ignite, the flammable jacket can become a burning fuel source close to the skin that can burn the wearer by heat transfer through the FR fabric. What effect do deet-containing insect repellants have on FR clothing? Since deet-containing insect repellants contain flammable chemicals, applying them topically to FR garments may have a negative impact on a garment's flammability. Testing has shown that applying insect repellant containing deet to the garment itself increases the duration of the surface flame when exposed to a fire hazard. 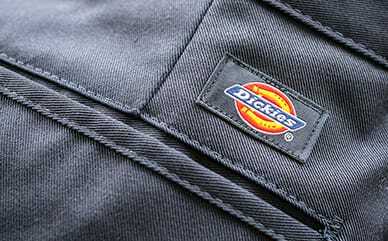 For this reason, Dickies FR recommends applying insect repellant directly to the skin and not on the garment itself. How is FR clothing cleaned? Most flame resistant garments can be laundered at home using "normal" detergents and procedures. Most FR products prohibit the use of chlorine bleach for a variety of reasons. FR garments should be laundered separately. Fabric softeners used in the dryer (such as "bounce" sheets) are safe for use with FR clothing. Many FR products can be industrial laundered. Each Dickies FR garment contains a label with home laundering instructions, and Dickies can provide industrial laundering instructions upon request. Laundering instructions vary by FR fabric, so please check labels carefully before laundering. How are FR garments repaired? FR garments should be repaired with FR materials and components consistent with the original materials in the garment. Repairing FR garments with non-FR thread or fabric can compromise the thermal performance of the garment. Most FR garment manufacturers or service companies can do repairs or provide the appropriate materials. How often does FR clothing have to be replaced? The wear life of FR clothing is very dependent on the type of fabric used and the quality of the garment construction. Some types of garments can last more than 5 years, while other types may last 9 to 18 months. Garments should be replaced when they are beyond repair, contaminated, or aesthetically unacceptable. When should FR garments be retired? Garments should be removed from service when they have holes or tears that cannot be repaired, or when the fabric has thinned and become "thread bare." Garments contaminated with flammable substances should be removed from service if the garment cannot be adequately decontaminated.